The 66-year-old happiest man turned his back on Parisian intellectual life 40 years ago and moved to India to study Buddhism. 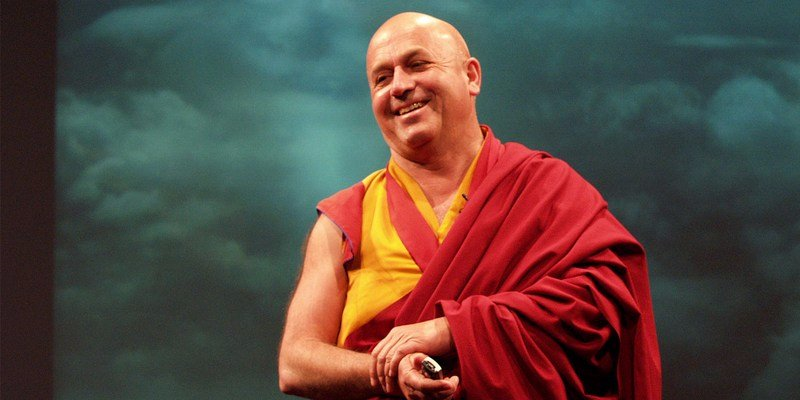 He is now a close confidante of the Dalai Lama and respected western scholar of religion. The scans showed that when meditating on compassion, Ricard’s brain produces a level of gamma waves – those linked to consciousness, attention, learning and memory – ‘never reported before in the neuroscience literature’, Davidson said. Interestly compassion is Ricard’s main secret to being the happiest man in the world. 1) A healthy mind should act like a mirror – faces can be reflected in a glass but none of them stick. Use the same technique with thoughts – let them pass through your mind but don’t dwell. 2) It’s impossible to stop thoughts from coming but focusing on a particular sound or the breath going in and out calms the mind, giving greater clarity. Controlling the mind is not about reducing your freedom, it’s about not being a slave to your thoughts. Think of it as directing your mind like a boat rather than drifting. 3) Be mindful – pay attention to the sensations of your breath going in and out. If you notice your mind wandering simply bring it back to focusing on your breath. This is known as mindfulness. You can apply it to other sensations to bring you into the ‘now’ rather than dwelling on the past or future. You could focus instead on heat, cold and sounds that you hear. 4) Once you’ve achieved some skill in this you can use that to cultivate qualities such as kindness, or dealing with disturbing emotions. He says everyone has felt all-consuming love but usually it lasts for about 15 seconds, but you can hold on and nurture this vivid feeling by focusing on it in meditation. If you feel it becoming vague you can consciously revive it. 5) Like when playing the piano, practising the feeling for 20 minutes has a far greater impact over time than a few seconds. Regular practise is also needed like watering a plant. 6) You can then use meditation to gain some space from negative emotions. Ricard says: ‘You can look at your experience like a fire that burns. If you are aware of anger you are not angry you are aware. Being aware of anxiety is not being anxious it is being aware.’ By being aware of these emotions you are no longer adding fuel to their fire and they will burn down. 7) You will see benefits in stress levels and general wellbeing as well as brain changes with regular practise in a month. Those who say they don’t have enough time to meditate should look at the benefits: If it gives you the resources to deal with everything else during the other 23 hours and 30 minutes, it seems a worthy way of spending 20 minutes.